One of the things I learned from the last Blog was to create ‘default settings’ for myself. By that I mean set up a few tricks and routines to drag me across to the keyboard and actually post something. So it being Wednesday evening and a quiet night at work I thought I’d use the company’s time (I like to think of it as a form of recycling) to start a weekly tradition. To wit, posting up an old motorbike photograph that’s caught my attention. There’s a huge resource of motorcycling imagery hidden away in the on-line archives of Libraries. Here in the Antipodes the Australian National Library has a site called Trove. It acts as a repository for a lot of the images from the smaller State, Council and Municipal libraries. Really cool old stuff that by and large rarely sees the light of day. Theres no rules to my schedule. I post whatever holds my eye. Heck the photo don’t even have to be old but if It’s Wednesday, make sure to post that picture! 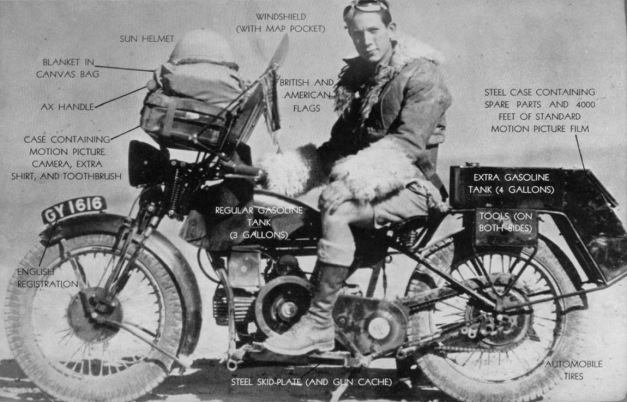 Robert Edison Fulton (Jr) was apparently the first person to circumnavigate the globe on a motorcycle (solo) and Douglas were the company that provided him with the Bike. It’s not that far from a modern ADV outfit if you look at without a patronising eye. Douglas were one of the many English manufacturers that went to the wall in the 50’s but from what I can find out Mr Fulton’s bike was from their heyday in the early 30’s. It was powered by a twin cylinder, 600cc, side valve, 4 stroke engine. It had a boxer type configuration which means each cylinder was directly opposed to its cousin on the other side of the Crankshaft. Similar to the old airhead BMW motorcycles or Porsche/VW, even Subarus and plenty of piston powered aircraft engines. Designing it this way gives you almost perfect balance as each piston/conrod moves in and out at the same time thus balancing out the reciprocating mass of its opposite. You’ll note I said almost perfect. If you think about it both conrods can’t share the same spot on the Crankshaft so they are offset a little from each other and that induces a ‘rocking’ imbalance. I don’t think it’s that big a deal as there are no counterweights that say an inline engine utilises to balance things out (I really should find out about that). Anyway the end result is you get a very smooth combustion cycle with the added bonus of a lot of riding stability as there are no tall cylinder towers pushing the weight upwards and affecting the bike’s handling. Interestingly Douglas choose to lay their engine down longwise in the frame not cross-wise like BMW. You’d think this would create problems with the rear piston overheating, sheltered as it is behind the front barrel (It’s not a water-cooled engine remember so it relies on movement to create an airflow and dissipate the heat). I guess getting the heat out is the reason for all that beautiful finning cast into the heads, the cylinders, even the dry sump. 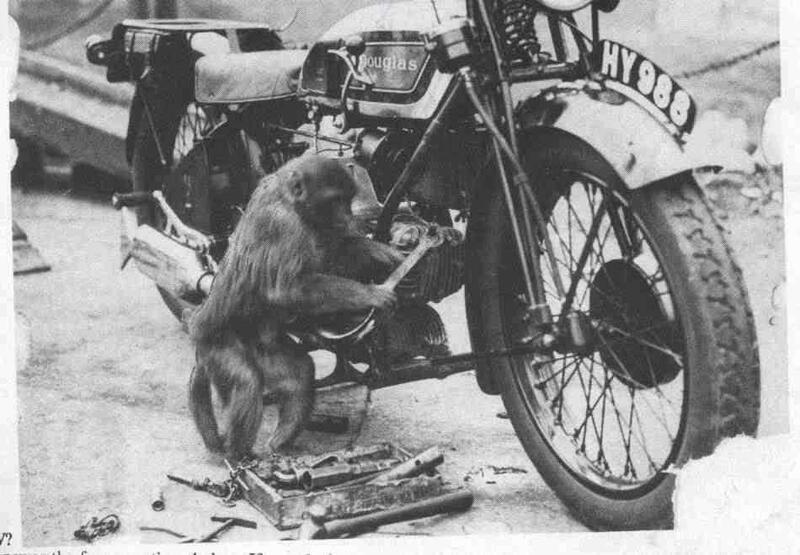 Just as an aside old air cooled Ducatis faced the same problem and Ing Taglioni tilted his 90 degree Vee Twin engine in an L configuration to address the issue. No doubt the Douglas forums would answer the question of overheating but for the time being it remains an imponderable. So getting around to the Monkey and The Douglas. The photo is from Mr Fulton’s book One Man Caravan which I’d not heard of up till now. However I’ve found a modern reprint on eBay so any day now it should be landing in my letter box. It’s a great read by all accounts.